We are the only on-line company where you can buy Hotstuff analgesic cream in this country! Hot stuff comes from New Zealand and is hugely popular there with professional athletes, as well as ‘plain folk’ who want warm, soothing, pain relief. Hot stuff is also used as a pre-exercise rub to warm up your muscles! Use Hot-stuff instead of a heat-pack. It heats up and warms your muscles, connective tissue and ligaments to relieve your aches and pains. Use BEFORE exercise as a ‘pre’ warm-up or AFTER to help in your recovery and reduce injury. HotStuff is also great to apply to sore muscles from any sort of over-exersion. Note: Contents in jar settles and is sold by weight not volume. No one else in the United States carries this product – We are your ONLY place to get Hot Stuff! We are the only on-line company where you can buy AntiFlamme analgesic cream in this country! Anti Flamme comes from New Zealand and athletes, physical therapists and achy people swear by it! Anti-Flamme is it! – If you like a cooling effect this will reduce swelling, bruising and inflammation in arms, knees, necks, etc. 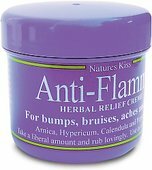 If you can’t get to a real ice pack – Rub a little Anti-Flamme on like an external “ice-pack” cream that feels terrific and will reduce pain and swelling. This works well while you are on the road, at work, in the car or anywhere else you that you don’t have direct access to ice. Non greasy, light smell which will disappear. Has Arnica, Callendula, Hypericum herbs for all the terrific therapeutic benefits. No one else in the United States carries this product – We are your ONLY place to get Anti-Flamme! Are All Your Nutritional Needs Being Met? Even when we eat well, our food does not always contain all the proper nutrients we need. Vitamin, Herbal and Nutrition Supplements for men and women – We make it simply easy for you, by providing you our favorite resource for supplements. We LOVE these Nutritional Supplements! They are only filled with GOOD things: No chemicals, No fillers, No Colors, No Crud! Don’t mess with Mother Nature. Why try and fool the body with synthetic vitamin pills when you can easily provide your body with convenient concentrated nutrients from actual whole foods grown out of the earth? Click HERE – You have to read about these supplements and herbal products! This DVD features Irene Diamond, RT. 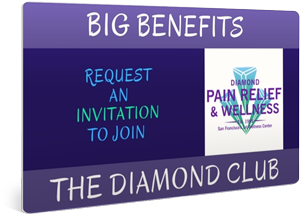 founder of Diamond Pain Relief & Wellness Center and creator of Active Myofascial Therapy ~ The Diamond Method™. Filmed on location in a sporting-goods store for a class Irene taught to the public – you’ll see over 45 minutes of raw (slightly-edited) instruction on how to give the best seated neck massage! Anyone can learn this simple massage technique that Irene will show you… Even YOU! 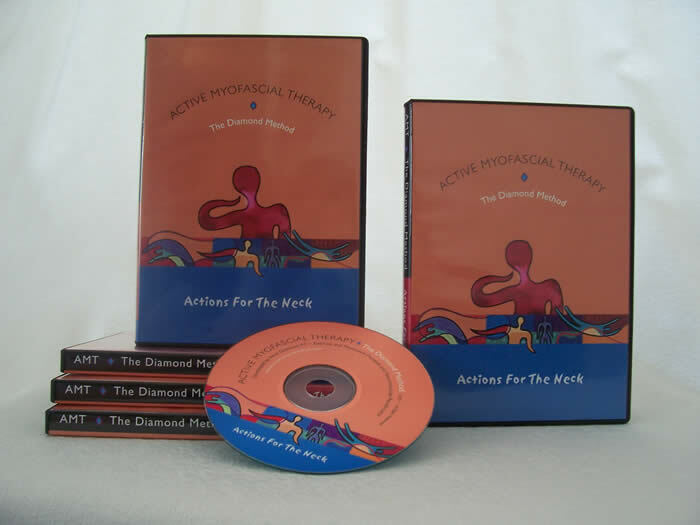 Incorporating the method of Active Myofascial Therapy – The Diamond Method™, you will be amazed at how simple it can be to really help someone feel better! Your friends, family and loved ones will LOVE YOU for watching this DVD! Get rid of their pain, help them relax and improve their range of movement! How to know if the pressure is too hard or to soft … Plus so much more! Grab your copy of the first in this series of DVDs. Watch Irene Diamond as she leads a client through gentle, effective ‘Actions’ performed for the NECK! “Actions’ are the therapeutic stretches and movements that are taught in an Active Myofascial Therapy – The Diamond Method™ session. These Actions will help you get rid of your pain, increase your range of movement, and improve your posture … easily! No more slouching! … No More Neck Pain! This DVD is simple to understand and easy to perform. Actions For The Neck, Volume One is available for you now. The Acu-masseur is one of the most unique massage tools and is extremely effective for home use to get rid of muscle tension and tightness! 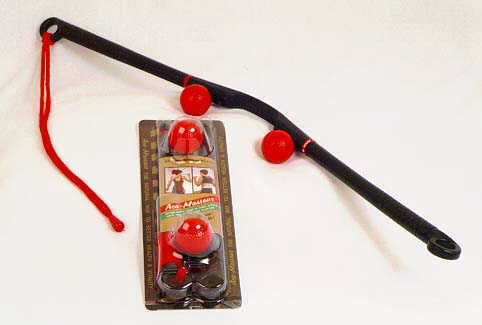 The two red balls act like hands squeezing the tissue while you gently pull the red rope and hold the black handle. The opposing force causes a gentle squeeze of tight muscles and fascia. Clients rave about the relief they get on their shoulders, backs and neck that they can deeply massage by themselves. Use it to get into any tight area. Slowly tighten the grip of the red balls of the acu-masseur as they hug and squeeze your tight, knotty muscles. Click here to download a pdf file for more information about this wonderful tool! This is the best relief for when you can’t get an appointment to see us to get rid of your knots, and trigger points. This tool applies direct pressure into any tight knot or ‘spot’ on your body and will quickly replace the corner of the wall or golf ball you now lie on to get into a trigger point! Use this at home to relieve your pain. (I wish I invented it!) You can access hard to reach spots – even behind your back! Just use the tool to reach those nagging aches and you will be verrry happpppy! New Price! Only $32.00 comes with detailed manual. 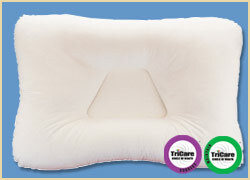 We have found the Tri-Core Cervical Pillow’s to be the best on the market. Their unique trapezoid center gently cradles your head and supports the neck in its natural position to help alleviate the pain that accompanies numerous maladies. While on your back, your head is cradled in the center hole. While on your side, your head is supported by the side panels taking the pressure off your shoulders. Most people who experience jaw, neck or shoulder pain are sleeping with a pillow that is not right for them! This Mid-Core pillow is recommended for those below 5’6” in height. Any personal information you submit while ordering from us is completely secure and private. We will NEVER sell your personal information to anyone. 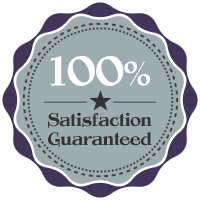 All products are 100% guaranteed. If you are not satisfied for any reason, please let us know in writting within 30 days of your purchase and we will arrange to give you full credit of your purchase price (less shipping and handling) to be applied to any item off any of the Diamond Websites or for credit to be used at the Diamond Wellness Center in San Francisco. All products will be shipped to you within 24 hours UNLESS back-ordered or SPECIAL ARRANGEMENTS HAVE BEEN MADE.